NOTE from DearMYRTLE: The following was received yesterday from our friends at AncestryDNA. PROVO, Utah and SOUTH SAN FRANCISCO, Calif., July 21, 2015 (GLOBE NEWSWIRE) -- AncestryDNA, an industry leader in consumer genetics, and Calico, a company focused on longevity research and therapeutics, today announced an effort to investigate human heredity of lifespan. Together, they will evaluate anonymized data from millions of public family trees and a growing database of over one million genetic samples. Financial terms have not been disclosed. AncestryDNA and Calico will work together to analyze and investigate the role of genetics and its influences in families experiencing unusual longevity using Ancestry's proprietary databases, tools and algorithms. Calico will then focus its efforts to develop and commercialize any potential therapeutics that emerge from the analysis. "On the heels of our AncestryHealth launch and our one million genotyped customers milestone for AncestryDNA, we're excited to announce this collaboration with Calico to research and develop life changing solutions," said Ken Chahine, Executive Vice President and Head of DNA and Health. "We have laid the groundwork for this effort through the combination of an unmatched family history database, one of the fastest growing genetic databases, and a strong and talented team of computer scientists and professional genealogists." AncestryDNA can provide access to a unique combination of resources that will enable Calico to develop potentially groundbreaking therapeutic solutions. The extensive research period will identify common patterns in longevity and human heredity through pedigree data. "Our common experience suggests that there may be hereditary factors underlying longevity, but finding the genes responsible using standard techniques has proven elusive," commented David Botstein, Calico's Chief Scientific Officer and member of the US National Academy of Sciences. "This is an extraordinary opportunity to address a fundamental unanswered question in longevity research using high quality human pedigrees." To learn more about the AncestryDNA, visit www.ancestrydna.com. For more information on Calico, visit www.calicolabs.com. AncestryDNA is owned and operated by Ancestry.com DNA, LLC, a subsidiary of Ancestry.com, LLC. AncestryDNA uses a simple test to analyze an individual's DNA. AncestryDNA offers the potential of identifying new insights into people's ancient ancestry to help them collaborate with distant cousins and make even more discoveries in their family history. For more information visit www.ancestrydna.com. This press release contains forward-looking statements. Forward-looking statements involve a number of risks and uncertainties that could cause actual results to differ materially from those anticipated by these forward-looking statements. Such risks and uncertainties include a variety of factors, some of which are beyond the company's control. In particular, such risks and uncertainties include the company's ability to add tools and features, and provide value to satisfy customer demand. Information concerning additional factors that could cause events or results to differ materially is contained under the caption "Risk Factors" in the Quarterly Report on Form 10-Q for Ancestry.com LLC for the period ended March 31, 2015, which was filed with the Securities and Exchange Commission on May 1, 2015, and in discussions in other of the company's Securities and Exchange Commission filings. These forward-looking statements should not be relied upon as representing our views as of any subsequent date and we assume no obligation to publicly update or revise these forward-looking statements. Calico (Calico Life Sciences LLC) is a Google-funded research and development company whose mission is to harness advanced technologies to increase our understanding of the biology that controls lifespan. Calico will use that knowledge to devise interventions that enable people to lead longer and healthier lives. Visit www.calicolabs.com. NOTE from DearMYRTLE: The following was just received from the Association of Professional Genealogists. WHO WILL HELP RUN APG THE WORLDS LARGEST ORGANIZATION FOR PROFESSIONAL GENEALOGISTS? Who will serve on the APG board -- making decisions on continuing education, a revised code of ethics and good practice, and new professional development initiatives? Send your recommendations (they can include yourself) to the Nominating Committee at admin@apgen.org. Please include each recommended person's contact information and their consent to be recommended. A statement of qualifications would help but is not required. Board members must be APG members in good standing who joined before 1 August 2014. We would like board members also to have a relevant skill and be willing to use it. These include financial management, secretarial, managerial, strategic planning, technology, marketing, law, public relations, member services, education, and writing. We also need recommendations for next year's nominating committee AND for president, vice-president, secretary, and treasurer, who comprise the Executive Committee EC). About half of the APG board, plus the EC, will be up for election or re-election this year. The Nominating Committee will prepare a set of candidates by September 15. The election will be held in late October. Newly elected board members take office 1 January 2016 for a two-year term. * maintain contact and communicate with the membership in some of the following ways: talking to other members, seeking out opinions, concerns, ideas; contributing to the APGQ or the APG eNews; participating in APG List discussions; joining a chapter or Special Interest Group. Copyright © 2015 Association of Professional Genealogists, All rights reserved. MONDAYS WITH MYRT - 13 July 2015. Practical, down-to-earth advice for family historians. Let's talk about what's trending in the world of #Genealogy. 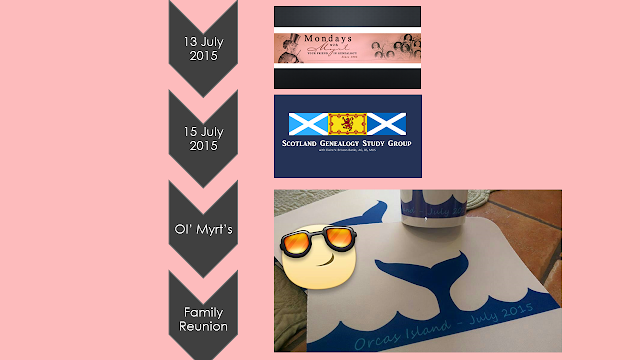 SCOTLAND GENEALOGY STUDY GROUP - Wednesday, 15 July 2015 with +Claire V Brisson-Banks. PANELISTS - We open the "green room" 15 minutes early if you'd like to test out your microphone and webcam. Consider JOINing the panel when we "scramble" to mix up the conversation a bit with new panelists. Over 400 videos study group sessions are archived on DearMYRTLE's YouTube Channel. Most have been sorted under the "playlist" tab. Hopefully, my DearREADERS will find discussions there to meet their needs while Ol' Myrt here is away enjoying grandchildren and building strong extended family relationships. An amazing, miraculous thing happened during the live broadcast of Wacky Wednesday: DiscoverFreedmen Indexing Project. To be as authentic as possible, my very distant cousin Wilma demonstrated the FamilySearch Indexing software by downloading a completely new (to her) type of Freedmen Bureau records than she had previously indexed. So what was the miraculous thing? Liza, a former slave, is mentioned with her sons Roderick and Tobe. The miracle is the statement of their relationship. Members of the African American genealogy community have taught me the beautiful phrase "We speak their names." +True Lewis explained what happened during our hangout was a real hallelujah moment. All genealogists thrill at the breakthrough when discovering more about an ancestor. So whether we say "Aha" or ""Finally" or "We speak their names" the meaning is the same. We're thrilled. Our people are our people. Together we can 'pay it forward' and get these Freedmen's Bureau records indexed! How's YOUR DiscoverFreedmen Indexing coming along? Hangouts: Pay what you want. So it's simple. If you value the work Ol' Myrt, +Cousin Russ and our beloved panelists do week in and week out on your behalf, please pay what you want. NOTE from DearMYRTLE: The following was just received from our friends at MyHeritage.com. Ol' Myrt here sure wishes she could inject this technology into every genealogy website search. TEL AVIV, Israel and LEHI, Utah – July 8, 2015: MyHeritage, the leading destination for discovering, preserving and sharing family history, today announced the launch of Global Name Translation™, a new technology to help families break through language barriers in the quest to uncover their past. The technology automatically translates names found in historical records and family trees from one language into another, in very high accuracy, generating all the plausible translations, to facilitate matches between names in different languages. In addition, a manual search in one language will also provide results in other languages, translated back to the user's language for convenience. This is a unique innovation not offered elsewhere, useful for anyone interested in discovering their global roots. There are many immediate benefits for users. For example, people living in the USA with Russian roots previously had to search for their ancestors in Russian to maximize their chances of finding pertinent information. The new technology will now accept searches in English, automatically increase their scope to cover Russian and Ukrainian as well, and conveniently translate all results back to English. The new technology also enhances the acclaimed MyHeritage matching technologies to bridge across language gaps. For example, If a user from Greece with a family tree in Greek, is related to a user from Israel with a family tree entered in Hebrew, MyHeritage will be able to connect them, automatically matching between names in the ancient languages of Greek and Hebrew, and show the two users how their family trees overlap, leading to exciting family reunions like never before. MyHeritage has developed this technology using original research, advanced algorithms and based on its massive multilingual and international database of 6 billion family tree profiles and historical records. The technology covers first names and last names and is able to tackle not only names encountered in the past but also new names it has never encountered before. The technology is generic but also utilizes extensive dictionaries built by MyHeritage to cover synonyms and nicknames. Therefore a search for Alessandro (Alexander in Italian) will also find "Саша" which is the Russian form of Sasha, a popular nickname of Alexander in Russia. The first version successfully translates names in between English, German, Dutch, French, Spanish, Catalan, Portuguese, Italian, Norwegian, Swedish, Danish, Greek, Hebrew, Polish, Czech, Russian and Ukrainian. The next version currently in development will add Chinese and Japanese, and additional languages will follow. 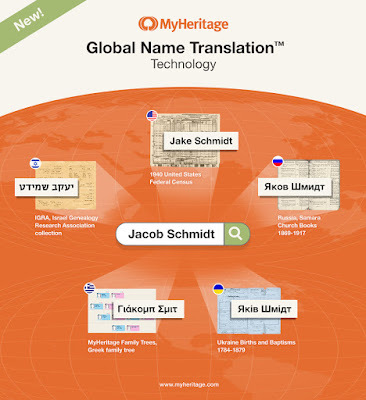 To take advantage of Global Name Translation™ technology, create a new family tree for free on MyHeritage and enjoy the automatic matches or use MyHeritage's SuperSearch search engine for historical records.